While the general population has a plethora of online travel sites to surf — TripAdvisor and Travelocity come to mind — for the disabled, resources have been scarce. However, a few avid travelers with disabilities have been paving the way with new websites, search engines and wikis. 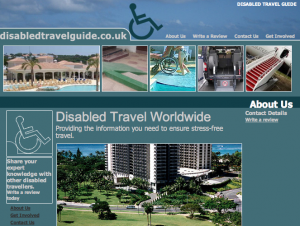 The newest spot for travel tips is Disabledtravelguide.co.uk, a U.K.-based website that lets disabled travelers rate and review worldwide destinations, towns and cities on accessibility, consideration, and attitude towards travelers with special requirements. What’s more, travelers can do all this before they’ve reached their destination, saving them potential frustration and havoc that could ruin their trip. Users of Disabledtravelguide.co.uk can offer personal reviews that reflect the reality of traveling with a disability — regardless of any claims made by hotel properties, tour companies or government agencies. They can also review their own home town or city, and view policies of major airline companies and discover what, if any, assistance is available to them. “The thing that people fear the most is the unknown,” says Disabledtravelguide founder Sean Gorman. By allowing disabled travelers to share their own expert knowledge and experiences regarding destinations around the world, they can anticipate difficulties and retain their independence to enjoy their travels, he says. Gorman, 36, knows a thing or two about disability travel. He was diagnosed with multiple Sclerosis in 1999, and developed the idea for a website while on a recent vacation to California with his wife, Sara. The couple reside in Kenton, England. Gorman’s site, which is nonprofit, is one of a few good sites that serve up candid reviews of travel locales, both domestic and exotic. Dr. Scott Rains, a travel consultant, has a blog called Rolling Rains Report that provides resources on inclusive tourism. He also runs a social networking site, Tour Watch. Another unique place for travel tips is Theglobalidea.com, a wiki started by Jakob Vendle, who has multiple sclerosis. Vendle’s idea came while he was traveling in Cambodia and visiting Angkor Wat, which he says was very difficult to walk. Users can add their own reviews, and edit other peoples’, too. A sample review for Honolulu reads: “The sidewalks in Chinatown are rather narrow and not in the best of shape. The Maunakea Market Place is wheelchair accessible but very crowded, a good place for lunch. Earlier this year, Craig Grimes launched Accessible.Travel, an instant online booking engine for disabled travelers. Grimes, a seasoned traveler and a paraplegic, has spent the last few years living in Nicaragua navigating the country’s inaccessible roads and stores via a wheelchair. He also operates AccessibleNicaragua.com and AccessibleBarcelona.com, two ventures that he began after realizing the dire lack of information about accessible adventurous vacations. Nate and Nancy Berger of West Virginia have published a free e-book that gives good details on places that will accommodate disabled’ travelers needs. The site provides an assistance directory as well as tales of travel obstacles, such as when the couple traveled to India to see the Taj Mahal and found the palace was virtually inaccessible to Nancy’s wheelchair. Even if you’re not going that far (and who is, these days? ), check out these sites for the disability travel scoop. whereslulu.comwhereslulu.com).Hi – I just wanted to put in a plug for the online disability guide I helped to start, Where’s Lulu (http://www.whereslulu.com). It’s a user-generated reviews site where people can rate restaurants, shops, etc. based on their accessibility. We’re currently in Portland, San Francisco, and we just launched Boston. Hope you’ll take a look. Thanks.